Salt Lake’s BRAIN BAGZ have never failed to deliver a sound that absolutely devastates. Within these grooves, there is a highly volatile mix of rockabilly and late ‘70s punk infused with urban-decay-meets-fuzzed-out-psychedelic sensibilities. 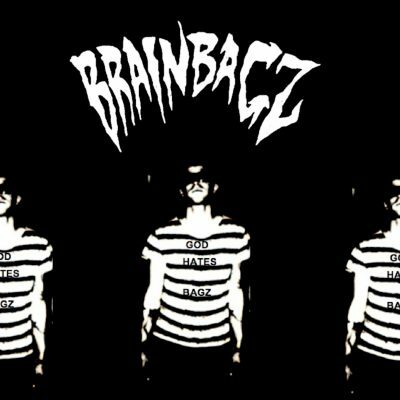 Those not yet familiar with BRAIN BAGZ are in for a real treat with God Hates BAGZ. This record presents the original lineup with Mikey Blackhurst (guitar, vocals), Kristin Maloney, (bass), Elisar Soueidi (drums) and Max Wilson (sax). This was Wilson’s last recording with BRAIN BAGZ before he departed in November. It was recorded by Die Group’s own Eric BigArm’s studio in L.A.
Running on 33 rpm, BRAIN BAGZ hold nothing back. On the A-side, there are two delightfully oppressive numbers, “No Thrill Taste For Thriller” and “Eye of Night.” Both tracks betray obvious nods to The Cramps or Kid Congo and The Pink Monkey Birds—albeit BRAIN BAGZ show off something definitely heavier thanks to the distorted vocals, fuzzed-out guitar, dooming bass beats and sinister saxophone. The B-Side’s “Static Static” shows off vocalist Blackhurst’s raw and defiant energy. His snarling is aggressive, as if on the prowl for some reckless fun. It’s the kind of snotty punk attitude that invokes the style of Stiv Bators or Lux Interior. In all, “Static Static” is the track on God Hates BAGZ that shows that BRAIN BAGZ are a band not to be trifled with. It’s swampy yet refined, much like their roots.